With a rating of 4.3 stars and more than 560 reviews already on Amazon, it’s safe to say the Echo Spot is a hot new addition to Amazon’s smart speaker lineup. 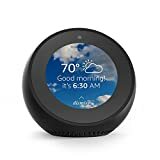 Unlike most Echo devices, the Echo Spot adds a small color display into the mix, allowing Alexa to display content rather than just answering questions, ordering products, and controlling your smart home gadgets. It’s a good value at $130, but you can save a nice chunk of change right now if you buy two. Add two Echo Spots to your cart in either color and you’ll automatically save $40!